HostExpress.com - Low cost web hosting services. 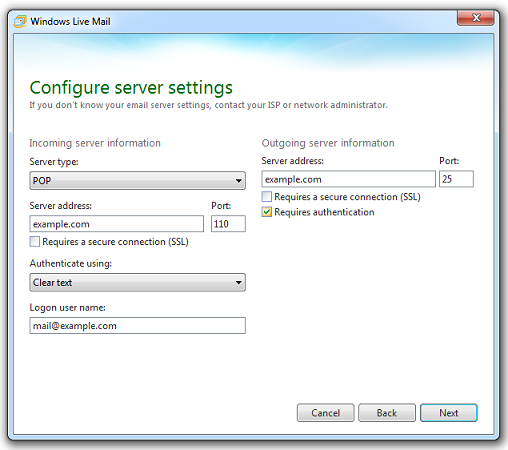 The instructions provided in this section were verified against Windows Live Mail Version 2012. They might not work with earlier or later versions of Windows Live Mail. Type in your email address and the password you chose or you can reset. Select the Manually configure server settings checkbox. Server address. You're server name is in your welcome email or lookup here. Requires a secure connection (SSL/TLS). Select this checkbox, try unchecking if you see connection errors. Port: What ports to use, see POP3 and IMAP Ports. Authenticate using. Select Clear text if you are using Plesk for Windows and chose POP from the Server type menu. Otherwise select Secure Password Authentication. Logon user name. Type in the name of your email account, for example, mail@example.com. Requires a secure connection (SSL/TLS). Select this checkbox, try unchecking if you see connection errors from your email app, please adjust ports accordingly. Requires authentication. Select this checkbox. We pride ourselves in making your online business shine! Hostexpress.com © 1997- All rights reserved.